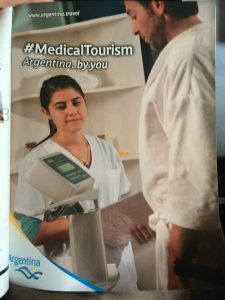 Advertising #MedicalTourism? Apparently so. If only the ad copy made any sense. I just struggle to see any narrative here. “Argentina, by you.” Does that mean Argentina is near or around me? That can’t be right. Or maybe it means I’m defining my trip. But that’s not right, either, because the DOCTOR is running the show. I’m confused. Who This Ad Thinks It’s Targeting: American males? Vaguely hispanic people who aren’t sure how much they weigh? People who want to travel abroad for cheaper medical treatment but think they’re too good for Mexico? Who This Ad is Really Targeting: This ad probably made the biggest impression with the copywriter’s mom. She’s probably so proud her little child grew up to create confusing ads that appear in prestigious publications like SkyMall. Biggest Improvement This Ad Should Make: Explain the nonsensical tagline. What does “Argentina, by you” actually mean? If they were going for a “Be in control of your healthcare choices” type of idea, they needed to make that much clearer.